This computer desk gives your students plenty of space to work or play together. Mobile Classroom Computer Desks from Wood Designs promote flexibility and learning. With plenty of room for a computer, monitor, keyboard and mouse, you can ensure that students have a comfortable, fully-equipped workspace. A keyboard shelf promotes healthy typing while the raised monitor platform keeps the screen at eye level to avoid neck strain. 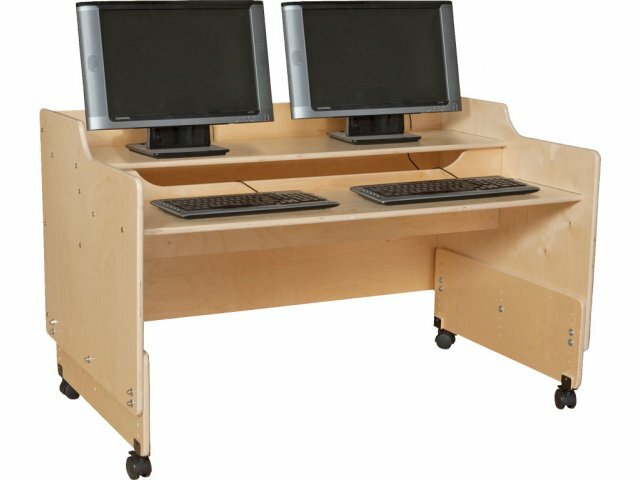 An adjustable height makes these classroom computer desks a perfect fit for students of various ages. The natural wood design of this computer table coordinates beautifully with other classroom furniture. It is constructed from sturdy baltic birch plywood, protected by an exclusive Tuff Gloss UV finish. Rounded corners and edges ensure that students are protected as they work. 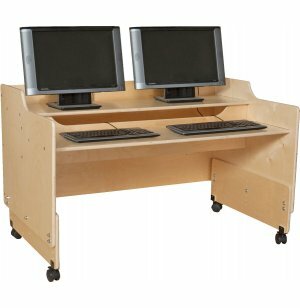 With heavy-duty locking casters, you can share this computer table among different classrooms or easily rearrange your space without any heavy lifting. No Hassle: Assembled computer tables are set up in no time. Great Size: Perfect for two students to work together. Healthy Position: Keyboard shelf and monitor platform contribute to an ergonomic workspace. Adjustable Height: Height is adjustable from 23”-28”, keyboard shelf height ranges from 18¼”-21¼”. Durable Material: Made from sturdy plywood. Protective Finish: Reinforced by a triple coat of the toughest, most durable, most stain and chemical resistant, easiest to clean UV finish. Non Scratch: All corners and edges are fully-rounded for absolute maximum safety. Sturdy Construction: Mortise, glue and steel-pin assembly produces strong, beautiful furniture. Smooth Mobility: Heavy-duty locking casters make it easy to move your desk from place to place.